For other uses, see Alexandria (disambiguation). Alexandria in the Caucasus (Greek: Αλεξάνδρεια στον Καύκασο) (medieval Kapisa, modern Bagram) was a colony of Alexander the Great (one of many colonies designated with the name Alexandria). He founded the colony at an important junction of communications in the southern foothills of the Hindu Kush mountains, in the country of the Paropamisadae. In Classical times, the Hindu Kush were also designated as the "Caucasus" in parallel to their Western equivalent, the Caucasus Mountains between Europe and Asia. Alexander populated the city with 7,000 Macedonians, 3,000 mercenaries and thousands of natives (according to Curtius VII.3.23), or some 7,000 natives and 3,000 non-military camp followers and a number of Greek mercenaries (Diodorus, XVII.83.2), in March 329 BC. He had also built forts in what is now Bagram, Afghanistan, at the foot of the Hindu Kush, replacing forts erected in much the same place by Persia's king Cyrus the Great c. 500 BC, Alexandria being in fact a refoundation of an Achaemenid settlement called Kapisa. The divinity of the city seems to have been Zeus, as suggested by coins of the Greco-Bactrian king Eucratides. Alexandria in the Caucasus is located to the south of Bactria, in the mountains of the Hindu Kush. 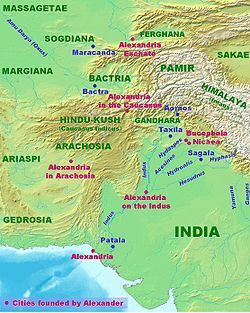 Alexandria of the Caucasus was one of the capitals of the Indo-Greek kings (180 BC-AD 10). "From Alasanda the city of the Yonas came the thera (elder) Yona Mahadhammarakkhita with thirty thousand bhikkhus." Some archaeological evidence concerning Alexandria of the Caucasus was gathered by Charles Masson (1800–1853), providing insight into the history of that lost city. His findings include coins, rings, seals and other small objects. In the 1930s Roman Ghirshman, while conducting excavations near Bagram, found Egyptian and Syrian glassware, bronze statuettes, bowls, the Begram ivories and other objects including statues. This is an indication that Alexander's conquests opened India to imports from the west. 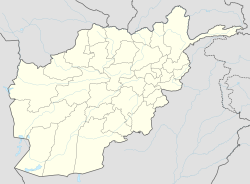 Today the cities' remains feature a rectangular tell 500 by 200 metres in area and a nearby circular citadel about 3km northeast of Bagram Airforce base. ^ Curtius Rufus, Quintus (2007). The life and death of Alexander the Great, King of Macedon in ten books. Ann Arbor, Michigan: Text Creation Partnership. p. 281. ^ "An Oasis Of Indicness: How The Kalash Of Pakistan Are Battling Extinction". Retrieved 2018-11-02. ^ "Alexander in the Hindu Kush - Livius". www.livius.org. Retrieved 2018-11-02. ^ a b "Alexandria in the Caucasus (Begram) - Livius". www.livius.org. Retrieved 2018-11-02. ^ "THE MAHAVAMSA » 29: Beginning of the Great Thupa". mahavamsa.org. Retrieved 2018-11-02. ^ Richardson, E. (2012-07-25). "Mr Masson and the lost cities: a Victorian journey to the edges of remembrance". Classical Receptions Journal. 5 (1): 84–105. doi:10.1093/crj/cls008. ISSN 1759-5134. ^ Francine, Tissot (2006-12-31). Catalogue of the National Museum of Afghanistan, 1931-1985. Paris, France: UNESCO Publishing. p. 354. ISBN 9789231040306.